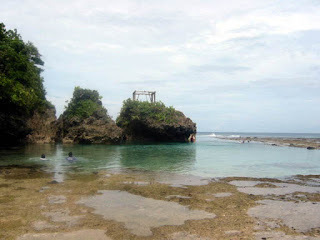 The Department of Tourism (DOT), through Secretary Joseph Ace Durano cited another tourist destination in the municipality of Pilar in Surigao del Norte where the world-famous Siargao island is located, and in this city, that will give additional reasons why local and foreign tourists should visit Caraga Region. In an interview conducted recently, Sec. Durano said that tourists are now looking for another attraction and experience while they are in Siargao for surfing. "With this development, DOT finds "Magpupungko" lagoon a perfect place to develop", Durano said. To date, Sec. Durano said DOT has allocated around P1.6 million as a share to the municipal government in developing access roads and basic facilities around the lagoon area. Sec. Durano added that DOT's share was already given to the municipal government of Pilar for them to implement the project as soon as possible. Durano also said that he has already signed the memorandum of agreement which means that the project will be realized soon through the local government unit of Pilar as the implementing body. Meanwhile, Sec. Durano also announced that the Agusan River Cruise Development project for this city has been approved and assured that before this year ends, the said project will be materialized and will draw local and foreign tourists to visit the city. "Here in Butuan City, the Agusan River Cruise Development project has been already approved and expect that before 2008 ends, local and foreign tourists will be coming over to experience river cruising", he said.